How do you compare? 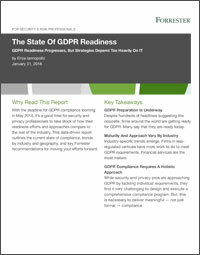 This data-driven report outlines the current state of GDPR compliance, trends by industry and geography, and key Forrester recommendations for moving your efforts forward. Dataguise is the only vendor to provide end-to-end sensitive data protection to help you meet regulatory requirements and maintain compliance as your business grows. 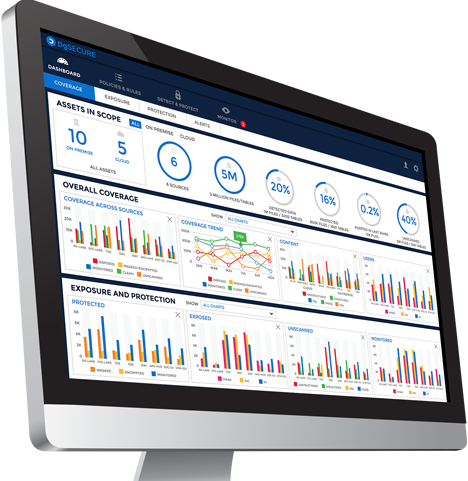 Whether you’re forklifting your entire data center or taking a selective approach, only Dataguise delivers the visibility you need to do business safely in the cloud. LEADING ENTERPRISES TRUST DATAGUISE TO SECURE THEIR SENSITIVE DATA—EVERYWHERE. We’re proud to secure the sensitive data of some of the largest, industry-leading companies who are committed to being responsible data stewards. DgSECURE IS THE ONLY ONE-STOP SOLUTION FOR SECURING SENSITIVE DATA ACROSS ALL REPOSITORIES. We deliver the only one-stop, out-of-the-box solution that secures sensitive data assets across all repositories, on premises and in the cloud. INDUSTRIES THAT RELY ON BIG DATA RELY ON DATAGUISE TO KEEP IT SECURE. Maintain compliance with the Payment Card Industry Data Security Standard (PCI DSS) and reduce risk in the event of a breach or audit. Ensure personal health information (PHI) and all data concerning health stays private and compliant with industry regulations. Keep highly personal customer information secure to build trust with the people your business relies on to grow. Safeguard the personal data of staff, citizens, and military personnel in all its forms, from SSNs to biometrics.